I got side-tracked, in a marvellous way, but still side-tracked, by courses. I know myself and my limits. 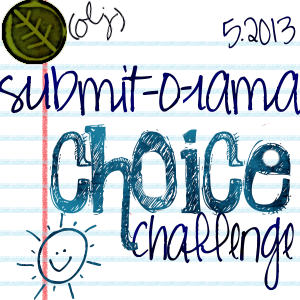 Further, I’m focusing on fiction at this time versus verse, so I opted for the Choose your own Challenge category, and set my goal, as I had back in October, at one submission per week. At the time, I was working on two short stories for submission May 31, 2013, and so I thought maybe a couple of flash fiction pieces, or something equally non-angst-inducing and I’d be able to make it. If necessary, I could polish up some of my older, unpublished poems and see what I could do, but then the learning opportunities came knocking, and I knew I wouldn’t have time to do more than the two stories. Last week, the deadline on one of the submissions I had planned was extended, and frankly, I was glad. Being out of town for training derailed my writing plans. So in the end, I submitted one short story in the entire month of May. I participated, but I don’t think that it could be considered a success. I’m remarkably okay with that though. I’ve got my fingers into so much right now, that something had to give. I’d submitted a guest post that was to have gone live sometime in April but my colleague’s even more hectic schedule intervened. There was some hope that the post might have been rescheduled in May, but the month has passed and it looks like it won’t see the light of day any time soon. It’s only the second guest post I’ve submitted. It’s also the second that didn’t pan out. An interview that I arranged recently also seems to have fallen through. There’s a saying that if you aren’t failing, that you aren’t doing enough to stretch yourself. I agree with that, so long as the individual who perceives their actions as failure can put the attempt in a positive frame. Otherwise, it can weigh on the soul. My perspective: so long as you’ve tried your level best, you’ve upheld your part of the bargain. I put my best effort into everything that I do, or try. I can feel satisfied with that and I learn something important every time. At the end of the day, it is enough. I am enough. Are you failing upward? Have you had some perceived failures recently that have left you questioning yourself? How have you overcome the negative and turned it into a positive? ← The yard, she be nekkid! Absolutely. I’m grateful for the encouragement. It just wasn’t to be this time around. Always look for the silver lining! And as long as you’re keeping your head up toward the goal- you’re a head of everyone sitting on the couch thinking of things to write and/or submit! Hi ya, Mel. My Submit-o-Rama was a fail, too. I only wanted to get one more piece than I had in October (which was 4) but I only submitted two stories in May. Kasie, that’s one more opportunity to get published than I managed 🙂 We’ll both be world-famous authors before you know it! Actually heading to a conference next week, so my chin is definitely up. Keeping the upper lip stiff too 😉 Getting back in the swing of things. Oooooo, a conference? Sounds like fun!